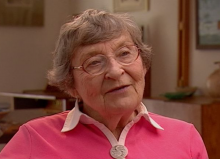 Born Saartje Wijnberg in 1922, Selma (she changed her name in 1957 when she moved to the United States) grew up with her three brothers in the Dutch town of Zwolle, where her parents Samuel and Alida had built up and owned a successful kosher hotel. Selma later recalled her childhood as idyllic: her family was religious and a main provider of kosher food in the area, but Selma also had lots of non-Jewish friends. Anti-Semitism was never a problem growing up, she remembered. That all changed with the rise of Nazism, particularly after Germany invaded the Netherlands in 1940. Selma was able to finish high school, but as a Jew she wasn’t allowed to go on to college. 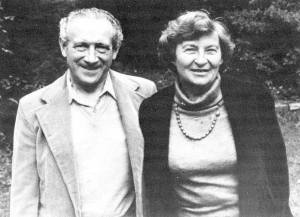 She worked for a time in a hospital until she and other Dutch Jews were barred from most jobs. Jews were forced to wear a yellow star on their clothes, though for a while Selma would take hers off and covertly work as a home health aide. “They did it very slowly,” she later described of the growing anti-Semitism that the Germans spread and that would soon consume the Netherlands. “They did it in a way that nobody felt that there was something going on.” Gradually, local Dutch people began to turn on the Jews in their midst. Many Jewish men were forced into local work camps. Selma’s father was forced into a labor camp and died of a heart attack in 1941. Soon afterwards, a local Dutch official pressured Selma’s mother to turn over the hotel she owned to him. Selma’s mother felt she had no choice and the family moved in with an impoverished Jewish neighbor. In 1942, conditions were so bad that Selma went into hiding. For some months, she was hidden by a Christian family who used her as an unpaid maid, forbade her to talk to anyone and kept her in a state of semi-starvation. 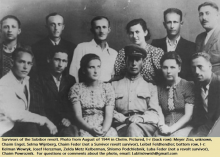 After a few months, she heard of another Jewish family being hidden nearby and went to join them – only to be turned in by local traitors in 1942. Selma was imprisoned in a succession of Dutch jails and concentration camps. First the SS-run Herzogenbusch concentration camp near the Dutch city of Vught, where she was put to work making dolls for children in the camp, then Westerbork, another Dutch concentration camp. On April 9, 1943 she was loaded into a train with 2,000 other Jews and sent to Sobibor, a top-secret death camp in Poland. Sobibor operated with one goal: to kill as many Jews as possible. There are no exact records but historians believe that between March 1942 and October 1943, between 167,000 and 350,000 people were murdered there. In Sobibor, Selma and the other prisoners were treated worse than animals. Occasionally they found a tin of food that a Jewish prisoner had hidden in their clothes. If any of the starving workers dared open a can of food, they were shot on the spot. Jewish workers were routinely beaten and killed. In that hellhole, Selma and another prisoner fell in love. Chaim Engel was a Jew from Poland who’d been deported to Sobibor with his family. He was the family’s sole survivor. When she met him, he looked terrible: he was bald and was beaten frequently. He used to wear two pairs of trousers at a time so that when guards hit him it hurt slightly less. On October 14, 1943, Chaim told Selma about an audacious plan he and some other Jewish prisoners were planning: they were going to fight the guards and break out of Sobibor. Did Selma want to take part? Facing certain death if they were caught, Selma agreed to join the uprising. On October 14, at 4pm, 1943, a group of prisoners lured guards into a storeroom and killed them with axes and knives. Eleven SS guards were killed, as well as several Ukrainian camp guards. The prisoners cut Sobibor’s telephone and electricity lines, and encouraged the other prisoners to escape. The scene was mayhem. SS guards were firing on the escaping Jewish with machine guns. About 600 Jews made a run for the perimeter fence, but few made it. Machine gunfire and land mines that dotted the grounds meant that most perished before they could make it out of the camp. Both Chaim and Selma miraculously survived. Selma later recalled how they escaped. “Chaim took my hand and he said ‘Come’ it’s no use we stay there. And then everybody starts running and then we walked to this gate, everybody was falling around (after being shot) next to us.” Chaim and Selma were among the 58 Jews who made it out of Sobibor alive. After the breakout, Germany was worried that Sobibor would be discovered, so they liquidated the camp, knocked down all its buildings, and plowed it over and planted crops. Yet, thanks to Selma Engel and others, the atrocities that had occurred there were not forgotten.